Conservation Act of 2009 (SBX7-­?7). observed in the state. It is increasingly important for water suppliers to consider how these trends are impacting water supply, demand, and drought patterns. Water suppliers can also make important contributions to reducing greenhouse gas emissions (GHGs), through energy savings from water conservation as well as other measures. 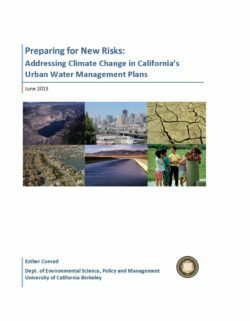 In its guidance to water suppliers for preparing 2010 UWMPs, the California Department of Water Resources (DWR) included an optional section focused on consideration of climate change impacts and GHG emissions. This study assesses how water suppliers have incorporated these factors into their 2010 plans. Drawing upon a sample of 2010 UWMPs, it examines the nature and extent of climate change discussion and analysis, and assesses how climate change risks have been incorporated into water supply and demand projections. The report also provides recommendations for how DWR could improve its guidance for 2015 UWMPs to support water suppliers in addressing climate change. All public and investor-­?owned utilities serving 3,000 customers or supplying at least 3,000 acre-­?feet of water annually are required to submit an Urban Water Management Plan to DWR every five years. Of the approximately 400 agencies submitting UWMPs, most are relatively small, with 90% serving less than 300,000 people, and 40% serving less than 50,000. Most are public entities, but some are private companies, including three investor-­? owned utilities with multiple service areas across the state. Large and small water suppliers tend to differ in their access to resources for planning and analysis of issues such as climate change. For many small suppliers, UWMP preparation serves as their primary long-­?term planning process. Suppliers also vary in the nature of their vulnerability to drought and the impacts of climate change. Larger suppliers usually have multiple sources of supply, while small suppliers are more likely to rely on a single source, especially groundwater. These small utilities are less likely to have relationships with other suppliers, thereby reducing their options for coping with severe droughts. small suppliers (serving 50,000 – 300,000 and less than 50,000 customers, respectively). Each UWMP was analyzed for its content related to climate change, and classified according to the degree and focus of discussion. This report is also informed by informal consultations with representatives of water supply agencies of different sizes. 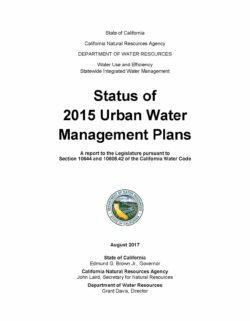 The Department of Water Resources (DWR or Department) respectfully submits this report to the Legislature pursuant to the requirements of the Urban Water Management Planning Act. Specifically, California Water Code (CWC) §10644 and §10608.42 require the Department to summarize the status of Urban Water Management Plans (UWMPs), exemplary elements of UWMPs, progress towards achieving a statewide water use reduction of 20-percent by the year 2020 (20x2020), and provide recommendations to achieve the targeted 20-percent reduction in statewide water use by 2020 in this report. This report incorporates the CWC’s §10608.42 (SB X7-7 of 2009) requirement for DWR to report progress towards achieving a 20% reduction in per capita urban water use by December 31, 2020. The statute requires DWR to include recommendations on changes to water use efficiency standards on urban water use targets needed to achieve the 20% reduction, and to reflect updated efficiency information and technology changes. UWMPs are prepared by California's urban water suppliers to support their long-term resource planning and ensure that adequate water supplies are available to meet existing and future water demands. The Urban Water Management Planning Act (CWC §10610 – 10656 supplemented by CWC §10608 et seq) specifies the requirements for UWMPs. Every urban water supplier that either provides over 3,000 acre-feet of water annually or serves 3,000 or more customers is required to submit an UWMP in years ending in one and six. To date, 400 out of 435 urban water suppliers have submitted their 2015 UWMP, a 92% compliance rate. 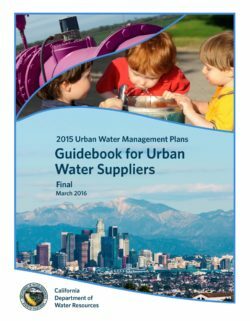 The Guidebook for Urban Water Suppliers (Guidebook) has been developed by Department of Water Resources to assist urban water suppliers in preparing 2015 Urban Water Management Plans (UWMPs or Plans). This guidance is intended to ensure the Plans will address the requirements of the California Water Code (CWC), provide useful information to the public about water suppliers and their water management programs, and provide a framework for water planning to minimize the negative effects of potential water shortages. Water suppliers need not limit themselves to the requirements and recommendations found in the Guidebook. Suppliers may include any additional information that will assist in providing a full description of their water resources and water management.